Hug Music aims to nurture a love for music in each student and strongly believes that learning music should be fun. Teachers at Hug Music make sure that each student enjoys and owns his or her learning process. Our programs are unique and designed to foster each student as a musician and person. Students improve not only music skills, but also important life skills such as self-esteem and self-discipline. Learning music should be fun : We want all students to always feel joy when they touch their instruments. Music is a way to share their love and happiness with others. The most important mission of Hug Music is to nurture the love of music. When students are motivated, they own their learning process : We want to make sure students are motivated and inspired to become better musicians. Teachers provide ideas to inspire students and ways to help them improve their skills so that they can achieve their goals. Tailored lesson evokes students’ creativity and bring the best out of them: Music learning becomes most efficient when students employ creativity. We listen and assess each student’s interests, preference, strengths, and progress to tailor instruction to bring the best out of each student. Providing the right amount of challenge enables students to take challenges and help them grow self-esteem: Teachers at Hug Music are trained to assess each student’s progress and learning style and provide step-by-step and multi-sensory instruction. This ensures that we provide the right amount of challenges for each student. Hug Melody® Solo ( 5 to 7 years old ) Piano / Ukulele / Voice . . . This is Hug Music's original and unique method which was founded by Ms.Kana, director, with an aim to bring the best out of young students. It is an introductory class for regular private instruction for young and beginning students. In addition to private instruction on a chosen instrument, the lesson provides solfege singing, ear training, various instrument play, ear training, and fun music games to learn music theory. This class also aims to help students establish a practice routine. If you are not sure which instrument your child prefers, you can request to expose your child to both instruments. A 5-week package is available to new students. Hug Melody® Duo ( 3.5 to 6 years old ) Piano / Ukulele / Voice . . . If your 3.5 year old is leaning toward learning about music and playing instruments, rather than group music activities, Hug Melody® Duo is the best class. This is Hug Music's original and unique method which was founded by Ms.Kana, director, with an aim to bring the best out of young students. The class consists of two students with one teacher. Students participate in singing and fun music activitie, as well as learn solfege and basic music theory through fun music games, and learn how to play the instrument of their choosing. If you are not sure which instrument your child prefers, you can request to expose your child to both piano and ukulele. Please contact us or learn how you can get started. Regular Private Instruction (7 years old +) Piano / Ukuelele / Guitar / Voice . . . Regular private lessons are offered on piano, guitar, ukulele, and voice. Instructios includes music theory, ear training, and solfege.A 5-week package is available for new students. This unique class will foster each student’s creativity and fuel his or her passion for music. Students will learn how to compose their own songs while also learning how to play the guitar and basic music theory. In the lesson, students will have opportunities to record their own songs and will receive all recordings.A 5-week package is available for new students. Teenagers & adult students . 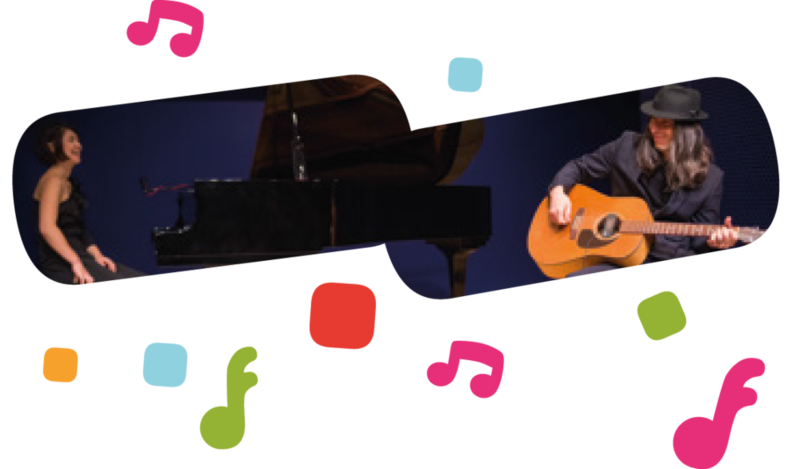 . .
For teenagers and adult students, Jazz Piano, Contemporary Guitar are also available besides piano, ukulele, voice lessons and songwriting. A 5-week package is available for new students.